You probably enjoy your new licensed Windows 8 successfully installed! Well, now let us dig into some details of this new opearting system. In certain cases you may need to have the ability to view hidden files and folders on your computer. By default, the system settings of Windows 8 hide this data from user’s attention for security reasons. How can you actually see your hidden files and folders then? Please follow the steps outlined below. At the “Start” screen click “Desktop” button. Use “Win+E” hotkey to open “Computer” window. 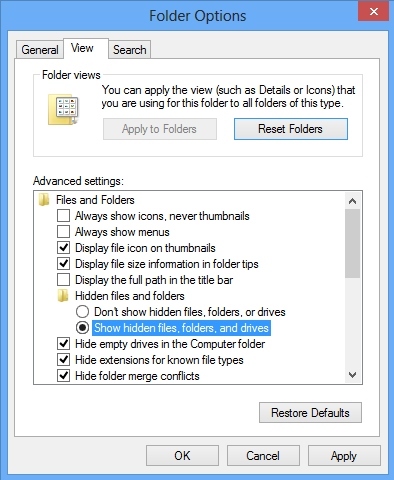 In the “Folder Options” window select “View” tab, then go to “Show hidden files, folders, and drives” (select this option). What to do if you can’t change Safari home page in Mac?